I am sure that if you asked 100 Christians to define worship, there is a good chance you would get 100 different answers. From the very time of creation of man God desired a people to fellowship with. Fellowship with God is best done through our worship of him. However as time has passed we have lost what it means to really worship God. Worship has become and event or a service on Sunday morning and some would think that worship only occurs through the singing of songs. 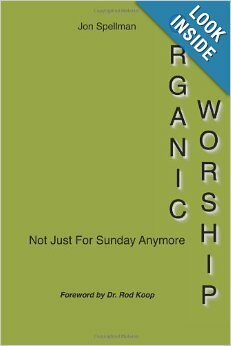 Author Jon Spellman puts forth the call for us to expand our definition of worship in his book Organic Worship: Not Just for Sunday Anymore. He speaks from his deep experience as both a Senior Pastor and as a church worship leader. If you know Jon (And he happens to be a friend of mine), he does not just poses the title of worship leader, but he is first and foremost a worshiper. In the book Spellman also cautions us not to try and recreate a great move of the spirit. Just because another church is having a great move, or if we have experienced a great move personally in the past means that we should try and recreate that experience. Worship is not a formula to be duplicated but a transparent submission to the will of God. And this submission should be something we live out each day. The fact that we are a worshiper should reflect in how well I perform my job and how well I love my family. We do it all for the glory of God. We must see worship as something greater than a Sunday morning service. It needs to become something that defines who we are. We were created to live a life of worship to a Holy God. Spellman also dedicates a chapter on worship ministry within the local church. I have read through the Organic Worship twice and I just concluded a Wednesday night teaching series at my church on the book. Jon Spellman serves as co-pastor with is wife Tina of Living Way Foursquare church in Adairsville Ga. He also serves the Foursquare Southeast District as the Director of Missional Vitality (Church Health) and Church Planting. He has a passion to raise up leaders and to plant new churches. Disclaimer: As I mentioned in the post I am personal friends with the author; however I purchased my copy of Organic Worship and Jon did not ask me to write this review. How do you live out the everyday life of a worshiper?